What if I told you that you’re awesome? Would you think I’m just trying to flatter you? You guys, as of today we are up to 988 birth kits donated and promised through this year’s Mothers Day drive! And we’re only one week in!! You read that correctly – 988 clean birth kits. And that’s not even counting the many that have emailed me saying that they’re making kits but haven’t yet confirmed numbers. Apparently there are a lot of people out there that think mamas and their babies are important. It’s not just about an impressive number, it’s about lives – the precious, valuable lives of women and children that hang in the balance of poverty, circumstance, and opportunity. While clean birth kits are not the solution to seeing maternal mortality in the developing world done away with, they will certainly make an impact in seeing infection decrease (the leading cause of maternal death). Putting a kit together is so, so simple. Find out more about assembling your own kit here. 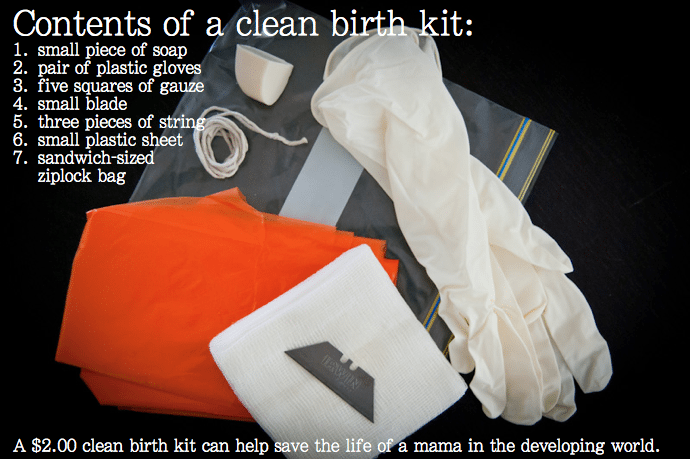 Or consider giving $10.00 to put kits into the hands of five expecting mothers. Thank you, thank you, thank you for getting involved in this year’s campaign. Every dollar, every kit, every prayer, every post makes a difference. Dear friends, haven’t gotten involved yet? Join the movement. Find out how here. Sweet! We haven’t even donated yet! It’s going really well Krystle. We so appreciate your contribution!! Congratulations! This is SO awesome! I’m so happy! just wanted to let you know that I reblogged this post after seeing it on Dear baby. You can see the repost here. Great work! I will send my kits when I have time, for now the repost was all I could do. I hope it helps.